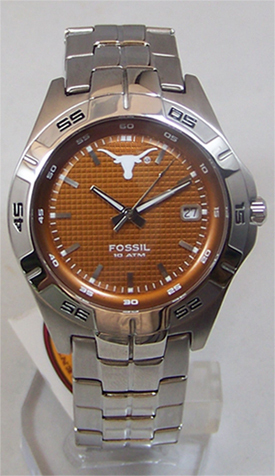 Click the button below to add the Texas longhorns Fossil watch Mens Three Hand Date Wrsitwatch Li2732 to your wish list. University of Texas Longhorns Fossil watch. New. Last one- no longer made. 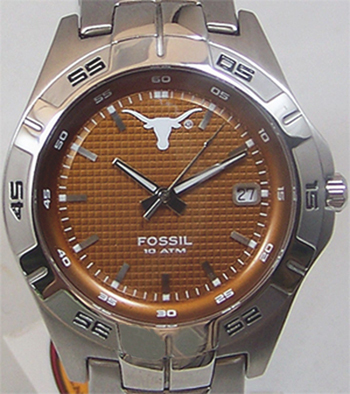 NEW Men's Texas Longhorns logo Fossil Sports watchwith date display. Applied team logo at 12 O'clock on a textured backgound. Comfortable contoured Stainless steel band. Date display window at 3 O'clock. Mineral crystal, luminous hands, three hand analog display with quartz movement. Water resistant up to 10 ATM (100 Meters, 335 Feet)Water resistant up to 10 ATM (100 Meters, 335 Feet). Ships in a collectible Fossil tin. This is a new, never worn watch in mint condition. These are no longer made since Fossil gave up the licensing rights. This style was the most popular and the first to sell out for all teams.